“Red our land” (Roja tierra nuestra), the story of an agrarian triumph. 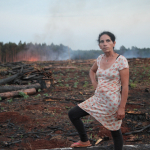 The documentary recounts the recovery of land the cooperative of Independent Producers of Piray (PIP) in Misiones, Argentina, reclaimed from the multinational plantation company Arauco. After 14 years of struggle, the cooperative demonstrates that another production model is possible. Organic family farming produces food where some years ago, large-scale pines and eucalyptus plantations degraded land and jeopardized local livelihoods.